I have been so looking forward to this day! I have my first Halloween freebie of the season to share with you! 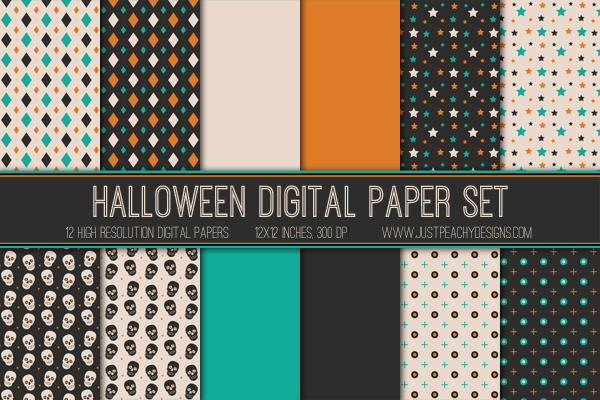 This set of 12 12x12 inch papers features fun and modern Halloween patterns in black, cream, orange and teal. I downloaded these patterns for free from Freepik. If you're not familiar with Freepik, go check them out - they have tons of really awesome graphics that are totally free to download. Anyway, just click the image above to download. Feel free to use these papers for any Halloween scrapbooking, crafting and digital design projects. Wow! You gave us amazing example of patterns. I've never heard about this source, but I was planning to check it out! I hope to find there lots of cool tons. Anyway, if I find my inspiration there, http://www.beforewriting.com will write a lot of essays for me about this site and all patterns I'll find. As a youngentrepreneur I find hand made crafts very interesting thing for a business. I'd love to try some of these paper sets and make something from it.